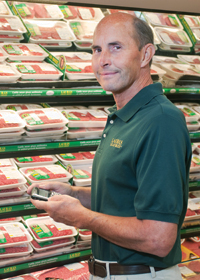 With over 7000 grocery stores carrying its products nationwide, Laura's Lean Beef has 40 sales people in the field conducting store visits and collecting information for the company ranging from inventory levels to status of POS materials. Store visits also include feedback on customer service and updates to store profiles. An outdated hardware platform for data collection in the field was proving costly, inefficient and inflexible and had reached end-of-life. In parallel, smartphones were being considered as a solution to consolidate basic cell phone use and email from laptops, as well as to improve the convenience and immediacy of salesforce communications. Ideally, implementing smartphones would also meet their data collection requirements. Any smartphone choice would require software that could handle their store call data collection requirements without requiring a large IT project, and at the same time remain flexible enough to meet their evolving needs. Laura's Lean Beef deployed smartphones and Flowfinity Actions in parallel. Using the point-and-click forms editor, Flowfinity Actions was quickly configured to work with an existing database and tailored to reflect the key areas of data collection required: inventory of their various product lines, POS marketing material for promotion of the brand in-store, feedback from store managers and customer service issues, and updates to store profiles through key contacts. The system was deployed within a few weeks, and with 2 days of training in each region, users were transitioned to the system and up to full productivity within 3 weeks. Now, sales personnel conduct store call reporting while in the store by simply selecting the appropriate Flowfinity Actions form on their smartphones, typing the information or even capturing photos, and submitting the information wirelessly back to head office. Store call data collection is now recorded in-store electronically with no need for paper recording or transcription of paper records. And since the store call data is rapidly transmitted to a central database, managers are able to see this information immediately after it's collected to better manage inventory and customer service.